Everyone deserves a beautiful smile, and at Jarosz & Valente Orthodontics, our mission is to help patients throughout the Arlington Heights and Deerfield, IL areas achieve one. We understand that every patient is different, which is why we offer a wide range of orthodontic treatment options including braces and ClearCorrect clear aligners, and we're proud to treat patients of all ages at our office. And sometimes, the best way to ensure a healthy smile is to start the treatment process early. First things first: if you're like most parents, you're probably wondering when your child should have their first appointment with an orthodontist. The answer might surprise you. In keeping with the American Association of Orthodontists, we recommend parents bring their children in for an initial evaluation at age 7. We may not start treatment this early on, but evaluating at this age allows our Deerfield orthodontists to spot any current problems as well as issues that may develop later in time. Depending on what our Arlington Heights orthodontist finds during the evaluation, we may recommend simply waiting and monitoring your child's development until the right time. In fact, this is by far the most common case, as most children don't require braces until they hit adolescence. However, in some cases, we may recommend starting treatment either right away or early on. This is because during childhood, we can do more than simply shift teeth alignment: we can influence the growth of the jaws, even using a device called a palatal expander to painlessly widen the upper jaw and create more room for the teeth. While it's not necessary for every patient, early treatment can dramatically lower the amount of time your child spends in braces and prevent invasive treatments later on – especially in the case of a few specific orthodontic conditions. Why Does My Child Need Early Orthodontic Treatment? Severe Crossbite: This condition causes the upper teeth to sit inside the lower teeth when the mouth is closed, which can cause a range of problems down the line. But because the two halves of the upper jaw are still separate during childhood, we can use a palatal expander to gently push the two halves apart, stimulating bone growth in between and painlessly widening the jaw. Severe Crowding: Crowding occurs when there isn't enough room in the dental arch to accommodate all the teeth, causing them to grow in overcrowded and crooked. While braces can alleviate the alignment issues, in some cases, we may recommend palatal expansion or tooth extraction to create more room for the teeth in the dental arch and help alleviate the problem. Protruding Teeth: Upper front teeth protrusion occurs when the upper front teeth jut out forward at an angle, extending too far beyond the lower teeth. In addition to causing problems in self-image, this puts the teeth at an increased risk for chipping and fractures. Often, we'll recommend early treatment to correct this problem and prevent unnecessary damage to the teeth. 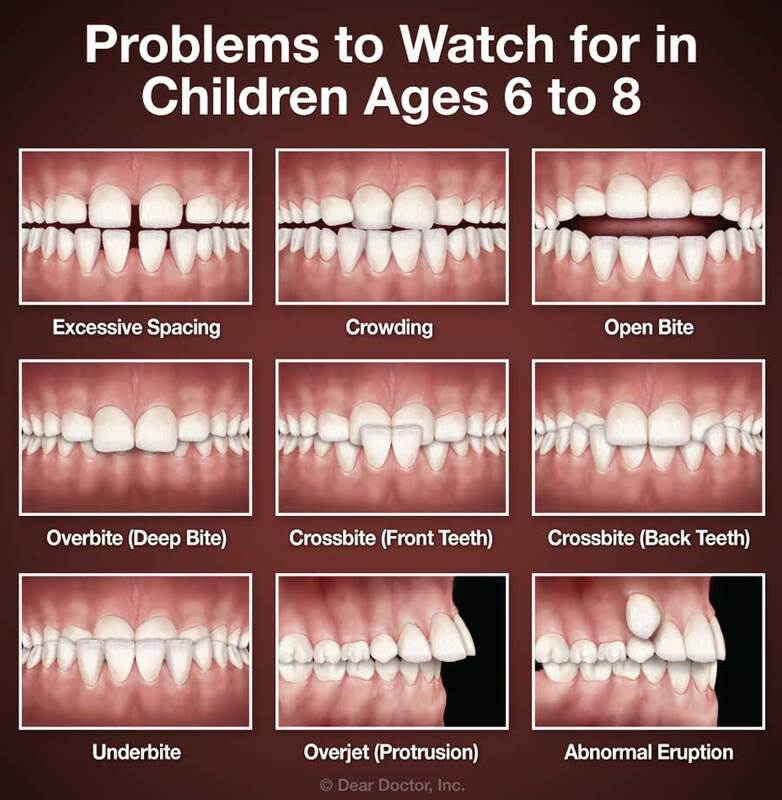 In addition to orthodontic malocclusions, we may also recommend early orthodontic treatment to correct a number of parafunctional habits that some children develop during childhood. In particular, there are three habits that usually benefit from early orthodontic treatment: prolonged thumb sucking, tongue thrusting, and mouth breathing. Prolonged Thumb Sucking: The sucking reflex is a natural instinct for infants and babies, and there's nothing wrong with it early in life. 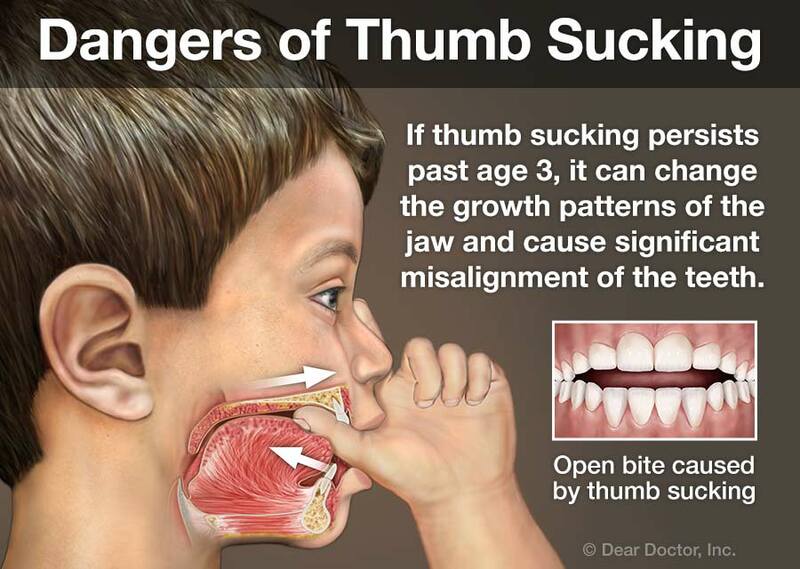 However, if thumb sucking goes on too long, it can start to cause problems in the development of the smile. Most kids stop sucking their thumbs on their own between ages 2 and 4, but if the habit continues past age 4, it can put pressure on the upper and lower front teeth, causing them to slant forward. Over time, this can form a condition called openbite, where the front teeth don't overlap when the mouth is closed. Openbite can cause impaired speech, chewing, and bite function, but we can solve the problem with a painless oral appliance that helps children break the habit effortlessly. Tongue Thrusting: Another problem some children develop is tongue thrusting, which is characterized by pushing the tongue into the front teeth while swallowing. Over time, this pressure can push the teeth forward, also potentially leading to openbite. Again, we can use an orthodontic appliance to effortlessly break the habit. Mouth Breathing: Finally, some children develop an abnormal breathing pattern called mouth breathing, in which the mouth always remains open and passes air directly to the lungs. Over time, this can cause changes to the muscular function of the tongue and face, as well as abnormal jaw development that leads to serious orthodontic problem. We can work with your child to develop a treatment plan that helps them correct their breathing pattern and safeguard healthy development. Early orthodontic treatment isn't right for every child, but in some cases, it's the best way to achieve a healthy, beautiful smile. If your child is approaching age 7 or you think they might be developing a bad oral health habit, we can help. Contact us today to discuss your child's orthodontic needs and schedule an evaluation appointment. We can't wait to hear from you, and we look forward to helping you or your child achieve a beautiful, healthy smile.